Take a tour of our Roosens Weg show home and you’ll find interiors that live up to the promise of the stylish façade. In the central living area, an exclusive SCHMITZ sofa, made by the famous Ateliers Charles Jouffre, and rare vintage armchairs are grouped around a coffee table by Berlin-based manufacturer Stefan Leo. At our five-room, two-bathroom show home in Haus Bahren, a RALF SCHMITZ development in the desirable Hamburg district of Othmarschen, the firm’s commitment to luxury style is instantly apparent. Here, design highlights and classics combine beautifully to create elegant, clean-lined arrangements, shades of pale zinc and warm cream provide the subtly refined backdrop, setting off quality materials such as oak, velvet, stone and marble to stunning effect, while burnished and gloss-finish brass accents add shimmering contrasts to the otherwise understated ambience. 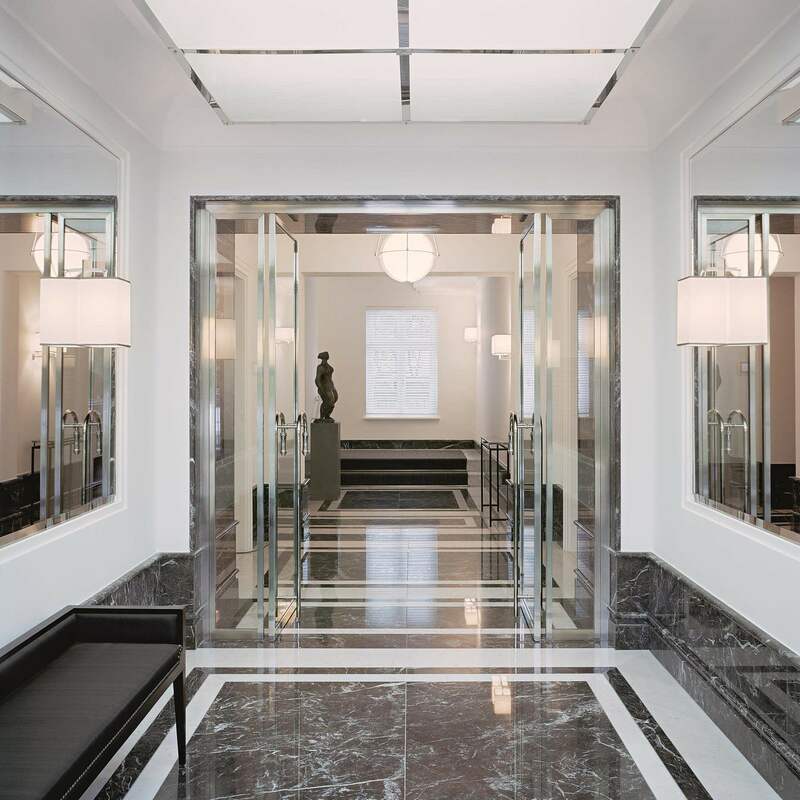 References to past masters of architecture and design are evident from the outset – the modern, minimalist entrance area, for instance, is illuminated by a reissued 1923 classic: Parisian architect Pierre Chareau’s “Bloc Auvent” metal-and-alabaster wall lamp – and this careful juxtaposition of past and present continues throughout the almost 160-square-metre apartment. Here, the centrepiece is a bespoke bed with a SCHMITZ-designed, Jouffre-made headboard upholstered in Designers Guild fabric. It is flanked by oak side tables, also custom-made for Haus Bahren. Above, Alvar Aalto’s classic “A 330 S” brass lamp provides atmospheric night-time lighting. With its gleaming unit fronts and clean-lined forms, the chic yet practical kitchen continues the contemporary-meets-classic theme. The kidney-shaped table and 1960s Tobias Scarpa lamp lend the custom-designed breakfast area an eclectic feel and further emphasize the exceptional aesthetic quality of this luxury home. Sophisticated and yet suitable for everyday living, our Haus Bahren show home eschews short-lived trends in favour of a blend of styles and eras that will stand the test of time –and thus epitomizes our commitment to creating enduringly high-quality homes.